Fall weed control and fertilizer applications might seem like a waste of time. After all, doesn’t grass pretty much go dormant for the winter, which is coming up pretty fast? Why bother addressing these issues right before the cool season hits? Right now is a tempting time to rake the leaves, trim the grass one more time, and call it quits until springtime. Atlanta’s “winter” is awfully mild, and our grass doesn’t really go dormant during the cool season. This is why the best lawn care companies overseed their properties with cool season grass seed. That’s also why the homes with year-round lawn service are green and lush all year long. With that in mind, here are a few reasons why fall weed control and fertilizing should not be skipped. There are some kinds of cool season weeds that grow most vigorously during the winter months. Applying a broad leaf weed control product to your lawn will knock those weeds back and allow your winter grass to shine. Remember, your new cool season grass needs all the water, nutrients, and sunshine it can get. Don’t let those weeds choke out your fresh turf. For the same reason, a pre-emergent weed control application will keep weed seeds from getting past the germination phase this winter. That means you’ll find far fewer visible weeds that you will have to yank by hand later. It also means you’ll enjoy healthier grass throughout the winter. A few different fertilizing nutrients may need to be applied to your turf in the fall and early winter. Nutrient selection depends on what kind of grass is growing in your lawn. Either way, these fertilizers will ensure your turf’s root system is strong and healthy when the growing season arrives in the spring. Fall is no time to get lax on your lawn care program. Autumn is the time of year to help your turf recover from a vigorous growing season and perhaps some damage caused by summer drought conditions. It’s time to give your grass extra nutrients to store until it’s really needed during the booming growth season next spring. It’s also the season for shoring up the root system and making sure it’s bolstered through the winter and into to spring. 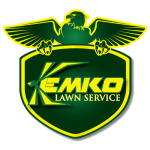 For more than three decades, Atlanta homeowners have trusted Kemko Lawn and Shrub to deliver top-notch lawn services. Throughout the year, our crews are busy making sure that our clients’ properties maintain the thick green turf we all desire. With so much experience tending to Atlanta’s lawns, we know exactly what your grass really needs at any given time. We can help you get the very best lawn you’ve ever had. Call us at 770-466-6113 to schedule fall weed control and fertilizing for your lawn.